The harder something is to achieve, the more satisfaction you get in achieving it. In light of that, catching a muskie is one of the most satisfying moments you can have in fishing, which is why getting the best muskie lures is vital in being able to get the big and aggressive fish to bite. 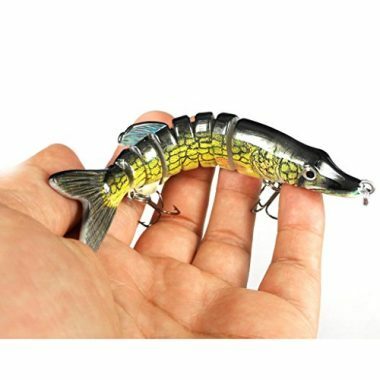 In order to get the best musky lures though involves making sure that you are buying a quality product, looking at the muskie lures reviews and going through all of the features. Thankfully we have done the hard work for you and once you’ve read through this guide, you’ll know exactly what you need. 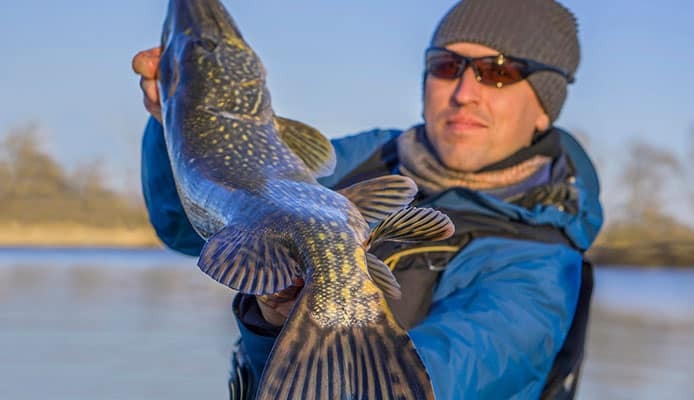 One of the best ways to get a realistic swimming action out of a large lure is by making sure that it is segmented so it moves freely in the water. This is a great sinking swimbait which has a lifelike appearance, making it great for catching muskie. 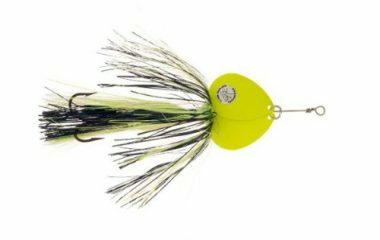 This is one of the top rated musky lures as it gives you everything you need to make a quality catch. This is a 10 piece muskie baits set from Discover Fish which is going to give you a great chance at catching the aggressive fish. They have two sharp treble hooks and are made out of tough ABS plastic which is painted in a realistic pattern. The wounded swimming action makes it tempting for any big fish. This is another segmented fish, this time from Lixada which is able to swim in an ‘S’ motion and has two strong treble hooks. It has a realistic look with its 3D eyes and it is strong enough to deal with the powerful fish. 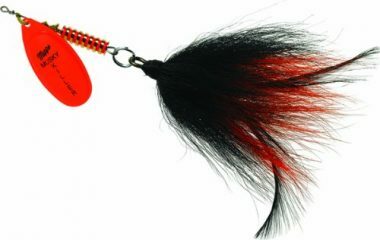 It has a great range of colors and is a proven performer when it comes to muskie. 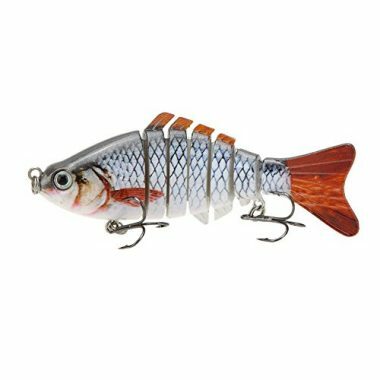 While the previous Lixada lure was made for a wide range of fish, this one has been specifically designed for pike and muskie. It has a long segmented body which has eight segments with two treble hooks attached. It’s available in various sizes and features a smooth and rapid diving action. These are a slightly different option when it comes to lures for muskie as these are a soft bait which comes in a pack of four. 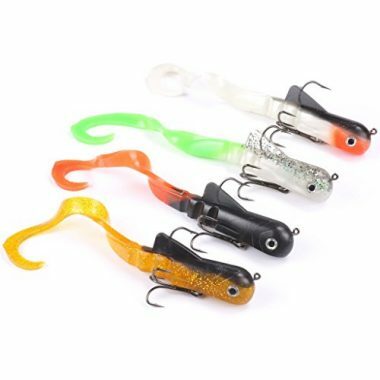 They are swimbaits which will be able to sink slowly when they are in the water and have a sharp treble hook in order to keep the bite on the end of the line. This is another different type of musky fishing lure but one which has received a lot of great reviews from those who have used them. The large tail hides a large hook which will be able to keep that musky on the end of the line until you have reeled it in. The high success rate makes this a must-have. 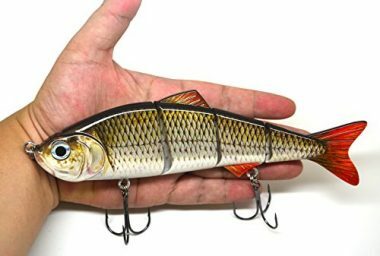 Goture are another company who have been able to produce a lifelike swimbait which comes in eight different segments and swim in the ‘S’ shape which can trick muskie into believing it is real prey. 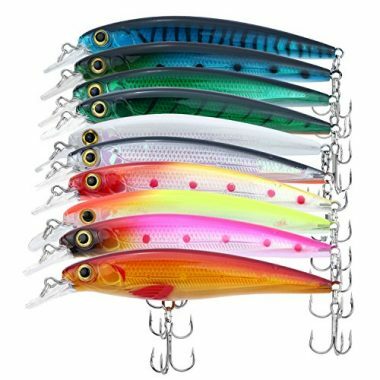 The design of the lure is brilliant and that high-quality design goes with the durable construction. 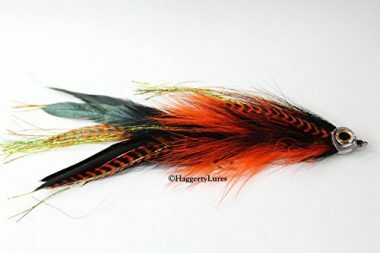 This is double showgirl bait from Musky which is highly rated by those who have used it. It comes in three different color options so you can choose the best one depending on your conditions. These inline spinner baits are able to vibrate through the water and attract fish towards them. This is another bait which has a lifelike design but that is not only in the painting work that has gone into it but also the swimming action it will have when it’s being dragged through the water. It has eight segments with two sharp treble hooks which are durable to go with the strong ABS body. This is another lure which is highly rated by those who have used it and has a proven success when it comes to luring in the fish that you want to catch. 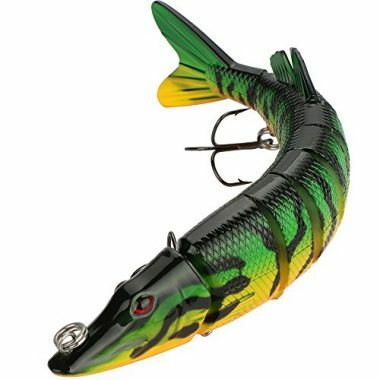 It features bright and flashy colors with its tail and it hides a strong hook which will be able to keep that muskie on the end of your line. The size of your bait is very important in determining the size of the catch that you are going to make. It’s a simple rule that the bigger lure you have, the bigger the fish you can catch with it. For muskie they can strike at bait which is anywhere from 4-12 inches long but around 8 inches is going to be the ideal size for a great catch. It’s always important to know the depth that you should be fishing in so your lure is able to be in the spot where the muskie is most likely to be. This mostly depends on the seasons as in warmer weather muskie tend to dive a little bit deeper in the summer but when the colder weather comes, they start to get a little closer to the surface, which is important to bear in mind. If you are going to be fishing in a weeded area then you might have a nightmare if you constantly have to deal with a lure which is getting tangled up in weeds. Having a weed guard will help to guard against this if you are using topwater muskie lures or anything which might be closer to the surface. It will make your fishing experience a lot more enjoyable. As we mentioned before, the temperature of the water can affect the depth that the fish will be swimming in but it will also change how they behave too. Fish are more lethargic in colder waters so therefore they need a slower presentation and a slower retrieval. Warmer water makes them a lot more active and that’s where fast retrieving baits can be perfect. It’s always a good idea to be able to experiment with different colors to see which one is going to be able to work the best for you but there are some general rules that can apply. In murkier waters it’s a good idea to use very bright and fluorescent colors which are going to stand out in the water but when it’s clearer, using more natural colors can often lead to the most bites. 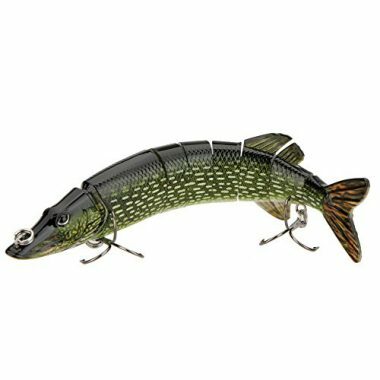 You will be able to see all kind of designs when it comes to these muskie lures but the most important thing is that they are well-made and able to sell it to the fish that this is going to be a real meal, whether that is done by sight, sound or both. Many of the realistic swimbaits are well designed to look and swim like the real things which can make them highly effective. Q: What Is A Muskie Lure? A: A muskie lure is simply any lure which is going to be ideal in order to catch the fish. 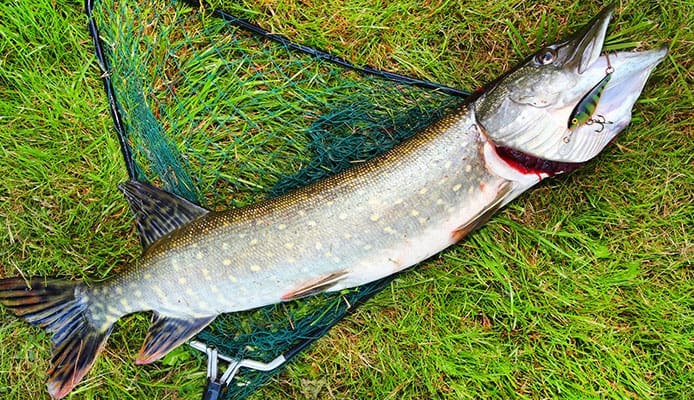 Muskie are big and aggressive so not all lures are going to be suitable so you need to ensure that you get one which is going to be able to cope with them without breaking. Using the wrong lure can not only leave you frustrated but it can be cruel to the fish. Q: How Do I Use A Muskie Lure? A: Using muskie lures are fairly simply depending on what type of lure that you are using. Some are more complicated than others and require specific techniques in order to get the most out of them. If you’re unsure on how to correctly fish with a specific type of lure then it’s important that you find out before heading out there. Q: Is It True That Big Fish= Big Lure? A: It’s a very simple rule but one that has a lot of truth due to the simple fact that bigger animals need more food. While it is true, it’s important to know the size of the fish you’re looking to catch and also the size of the baitfish in the area so you can get a perfect size. Q: What Type Of Hook Is Best For Muskies? A: The ideal hook for muskie often depends on the size of the lure that you are using and the size of the muskie that you want to catch. 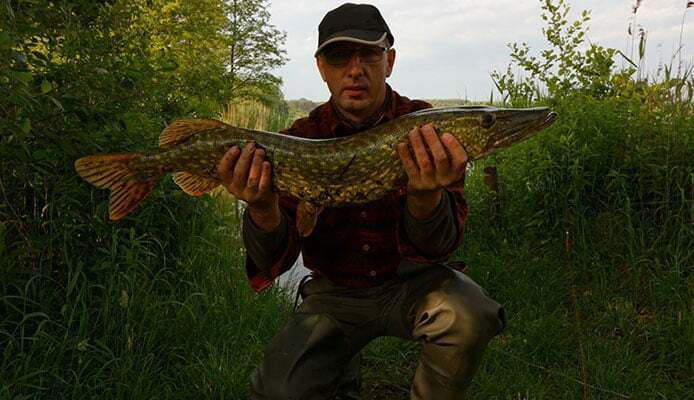 It’s important that they match up in size otherwise you might hook the fish in the wrong place, put it off from biting or simply be too small for a solid bite. Q: What Do Muskie Fish Eat? Or What Are They Attracted To? Muskie are a very satisfying fish to catch but can be difficult due to how aggressive they are and how big they can get. They take a lot of reeling in which makes have the best rod and reel even more important. There is no point having the best lure if you are unable to complete the catch. As well as lures, having the best fishing line is also important in relation to the presentation to the fish and have a bad line might ruin the good work that you have done in choosing the perfect lure. Having an all-around great fishing set-up is important for all types of fishing. With muskie it’s important to factor is the conditions that you are going to be fishing in as when it’s colder they will be slower and closer to the surface and when it’s warmer they will be deeper and more active. The size of your bait needs to match the fish you want to catch and the color and design can be important factors too. Having a weed guard is also ideal for any lures that are going to be close to the water. When you have considered all that you will be in the perfect position to choose the perfect muskie lure for you and one which has a proven track record of success. Hopefully this guide has given you all the information that you need in order to make your muskie trip a successful one.